A cool roof is a roof­ing sys­tem that deliv­ers higher solar reflectance (the abil­ity to reflect the vis­i­ble, infrared and ultra­vi­o­let wave­lengths of the sun, reduc­ing heat trans­fer to the build­ing) and higher ther­mal emit­tance (the abil­ity to radi­ate absorbed, or non-reflected solar energy) than stan­dard designed roof­ing prod­ucts. His­tor­i­cally, cool roofs have been either white or some other lighter shade color. How­ever, that dynamic has changed in recent years with the devel­op­ment of res­i­den­tial cool roof prod­ucts like Land­mark Solaris™ and Pres­i­den­tial Solaris™ from Cer­tain­Teed that can achieve Ener­gyS­tar® qual­i­fied lev­els of solar reflec­tiv­ity even in dark, rich hues. Cool roofs can also enhance roof dura­bil­ity and reduce both build­ing cool­ing loads and the urban heat island effect. 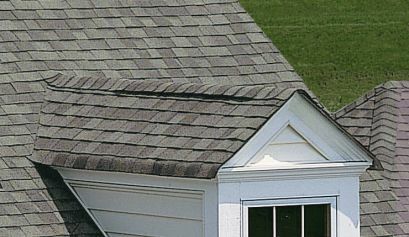 Accel­er­ated dete­ri­o­ra­tion of roof­ing mate­ri­als, increased roof main­te­nance costs, and high lev­els of roof­ing waste sent to landfills. Reduce energy use: A cool roof trans­fers less heat to the build­ing below, so the build­ing stays cooler and uses less energy for air conditioning. Reduce air pol­lu­tion and green­house gas emis­sions: By low­er­ing energy use, cool roofs decrease the pro­duc­tion of asso­ci­ated air pol­lu­tion and green­house gas emissions. Improve human health and com­fort: Cool roofs can reduce air tem­per­a­tures inside build­ings with and with­out air con­di­tion­ing, help­ing to pre­vent heat-related ill­nesses and deaths. CertainTeed’s Land­mark Solaris, Land­mark Solaris Gold, Land­mark Solaris Plat­inum and Pres­i­den­tial Solaris shin­gles are prime exam­ples of res­i­den­tial cool roof­ing prod­ucts that pro­vide an enhanced aes­thetic appeal. And for a shin­gle that is both energy effi­cient and impact resis­tant, try Land­mark Solaris IR.